The ultimate holiday entrée and side, a raspberry-glazed whole roasted turkey with chestnut and sausage stuffing. To Prepare Turkey: Remove giblets and neck from turkey; reserve for gravy. Rinse turkey with cold running water and drain well. Blot dry with paper towels. Prepare Stuffing: In large non-stick skillet, over medium-high heat, sauté turkey sausage and onions 5 to 7 minutes or until sausage is no longer pink. Drain. In large bowl combine turkey sausage mixture, bread cubes, chestnuts, parsley, thyme, sage and pepper. Add turkey broth and stir to moisten. Lightly spoon stuffing into turkey or a (9 x 12-inch) baking pan, sprayed with vegetable cooking spray. Cover casserole and bake at 350°F (175°C) 45 minutes. 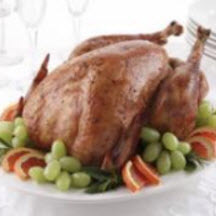 To Roast Turkey: Place turkey, breast side up, on a rack in a large shallow (no more than 2 1/2-inches deep) roasting pan. Insert an oven-safe thermometer into thickest part of the thigh, being careful it does not touch the bone. Roast turkey in a preheated 325°F (160°C) oven about 3 1/2 hours (total roasting time). Baste with the pan juices. During the last 30 minutes of roasting time, baste the bird with the Raspberry Glaze. Continue to roast until the thermometer registers 180°F (85°C) in the thigh, 170°F (80°C) in the breast and 165°C (75°C) in the stuffing. Remove turkey from the oven and allow the bird to rest for 15 to 20 minutes before carving. For Raspberry Glaze: In 2-cup microwave-safe glass measuring cup combine preserves, liqueur, vinegar, cornstarch, ginger and garlic. Cook in microwave oven at HIGH (100% power) 45 to 60 seconds or until thickened; stir. Use mixture as glaze, brushed over turkey during last 1/2 hour of roasting.